If he had to do it all over again, Kyle Lake would never buy another pre-sale home. 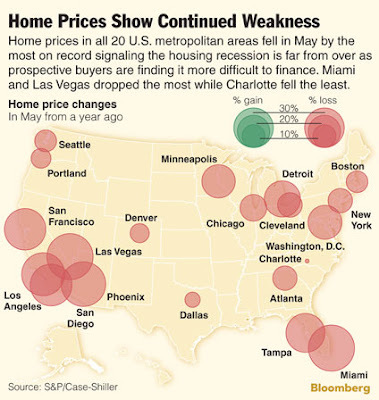 But, if some real estate experts are right, buyers are not likely to see the trend again for another seven to 10 years. Lake and his partner, Ashley Hughes, are among the tens of thousands of British Columbia families and individuals caught in a hot real estate market in the last few years. To get into the market, they chose to buy a condo that had not yet been built, commonly referred to as a pre-sale. A pre-sale is a contract for the purchase of a home, usually a unit in a condominium, made prior to its completion. In some projects, sales have been made before construction has even started. Purchasers and developers enter into a contract that provides for units to be built within a period of time for an agreed price. Real estate agents or lawyers for the developer usually hold deposits in trust as part of the agreement. In Lake and Hughes's case it took 15 months before they moved into their Langford two-bedroom-plus-den condo. When the young couple put their deposit down last April, the target date for completion was March 2008. A series of delays resulted in them finally moving in in late July. "If I had known it would take this long I would have looked for something else," says Lake, 23. He says the real estate market at that time was characterized by a lack of new condos to choose from, a low inventory of existing resale condos and real estate values that seemed to rise steadily. "Back then, there was this mentality to buy what you can and get into the market before they sold out." While he estimates his new condo is worth more than the $299,000 he paid, the delays surrounding possession and repairs on deficiencies in the unit have soured the experience for him. A recent cooling in the real estate market and an increase in the number of units for sale could signal the end to the trend. At the height of the boom, real estate agent Guy Crozier estimates, pre-sale contracts accounted for 65 per cent of his sales. It is a cycle he has seen repeat itself every seven to 10 years. With a rising real estate market, many purchasers buy units on the assumption that property values will be higher by the time the building is finished. Driven by high demand and low inventory of resale properties, pre-sales were a popular way for individuals and families to shield themselves from escalating prices. "In pre-sales, clients were shown a hole in the ground and asked to buy a piece of air," says Crozier, one half of the Crozier and Marchant team based out of Re/Max Camosun. He points to an overheated market where many investors entered the market looking for equity appreciation. They bought condos like stocks. The investors had no intention of occupying the suites, and usually sold them as the completion date approached. But their involvement in the market contributed to a shortage in supply, further driving up prices. With a downturn, more units are available for immediate sale, so there is almost no demand for pre-sales. "I haven't done a pre-sale in two months," Crozier says. "Condo listings are up 50 per cent." The numbers might be down for now, but developers say there will always be a place for pre-sales in the construction industry. Developers looking for financing for multi-unit projects are used to financial institutions demanding proof of a certain number of pre-sales before they commit to financing. "The more pre-sales you can bring to the table, the more confident the bank will be that the project will succeed," says Bob Gill, president of Parkway Alliance Developments. His Reflections development in Langford is 70 per cent pre-sold ahead of the project's September target completion date. While he says pre-sales aren't suitable for individuals who cannot wait to buy, pre-sale pricing -- which is generally lower than what the units will ultimately list for -- can be a good deal for buyers. But Gill cautions that pre-sale purchasers should do their homework and read the fine print on the disclosure agreements, as every developer has different wording in contracts. The contract is a legally binding agreement and buyers need to seek legal advice. He says deposits, which range from 10 to 15 per cent of the purchase price, are generally not refundable. Buyers who change their minds and try to get out of the contract can forfeit their deposit and can be sued by the developer for damages. Pre-sale buyers who try to sell their contracts might also find certain restrictions and fees for doing so. Even with a market slowdown, Gill is confident he will be able to sell the remaining units of his development. He says, "Ultimately, people like to touch and feel what they are going to buy." Emphasis mine. Kind of speaks for itself, don't it? Long story short: young guy and his girlfriend buy condo before built; young guy and girlfriend have less than positive experience with developer; young guy still confident that "my place is immune to downturn"; REALTOR confirms massive speculative buying drove prices upwards unsustainably and market is now very slow with rising inventory and falling sales, then says "sharpen yer pencil young fella"; Developer says: "I sell it all"; Developer doesn't say: "I dropped prices $20K" (he did, and will again); Market says: "Yawn, see you in 7-10 years". There you have it folks... Buyer turned homeowner, CondoKing and Langford Beautifier all agree, this market has boiled out. The G&M has an interesting story that, I think, while not only telling the present, also tells the future. There are few economists working for the big dogs--the banks, the real estate associations and just about any others that have their hands in the real estate pockets of Canada--that I trust to truly tell it like it is when it comes to market predictions. I think their mandate is to report the numbers as they currently are and have recently been, then look forward and seek language in their press releases and interviews that serve to soften the blow or the hype, in the name of the economy and their major shareholders. Armed with a critical mind, and a constructive attitude though, anyone is able to figure out what they need to from the numbers and subtle suggestions these financial wizards cast, to protect themselves from the spells of the bubble(s). 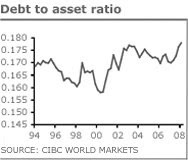 The slowing economy is taking its toll on household finances, driving up debt at a faster pace than incomes and assets, new analysis from CIBC World Markets shows. In the first quarter of 2008, household debt in Canada rose almost 3 per cent but personal disposable income rose just 2 per cent, pushing the debt-to-income ratio up to 130 per cent from 122 per cent a year earlier. At the same time, the level of assets hardly changed during the first quarter of 2008, since the stock market was correcting and house prices were levelling off. I bring this last point to your attention because it want to contrast it to what Mr. Muir says about the factors leading to, what he calls, "slow[ing] to a level not seen since the beginning of the decade... BC households are now cautious about making major purchases in light of uncertainty around fuel prices and other inflationary pressures." I would like it very much if someone, anyone, anyone, Bueller, Bueller, would write it down (oh wait, Merrill Lynch did): Western Canada is very much like every other housing market that has peaked and is now heading down: we are over-valued, over-building and under-selling expectations to margins not unlike other nations that experienced the same trends. In the last post below, the old "Victoria is different, don't you know, every boomer and their immigration cousins are moving here en masse and everyone else just got 40% raises" myths crept back in to the housing correction denier's talking points. The way I see it, is even if, and I use if here very strongly, because statistics from BCStats and StansCan do not support the claims, it wouldn't matter, because very few will want to buy RE when they know they can get it cheaper next month or next year--and the decline in sales is evidence enough for this theorist. And guess what? According to those experts with their hands in your pockets, the people, regardless of where they come from or how much they make, have started to figure it out. And now they are waiting to see what happens in the next 6 months or longer. Like us. I guess now that the writing is clearly written on the wall (but not in their paper) for buying a local property, the TC, in tribute to its obsession with hyping local RE, came up with this gem over the weekend. Here's the hype (emphasis mine). With the vacancy rate in Victoria 0.3 per cent, there's limited affordable housing available. (They are actually 0.5% which is a whopping 0.2% or 60% difference than what's stated... and they aren't reflective of the secondary market, which is where the majority of students find rentals). The average rent for a room in a house is around $400, while a one-bedroom apartment is around $750. However, many listings have rooms starting at $700, or one-bedroom apartments higher than $1,000. ...the eviction of 13 students from a 4,000-square-foot, nine-bedroom house because of a Saanich bylaw which prohibits more than four unrelated residents to share a dwelling. The three had a hard time finding a place, but rented a house for $2,800 a month. Year-long leases are a problem for students, unless they are intending to stay in town over the summer or rent a place for more than a year. To be fair, the piece is newsworthy, students do have a hard time finding a place to live in Victoria every September. That's why the smart ones look in May and get jobs in the ultra-low unemployment area that is Victoria. Short term landlords and recent Uvic/Camosun grads with huge mortgage payments believe that rents should pay at least 50% of their mortgage, so they ask for $1500 for a dumpy two-bed suite. Because of the way CMHC calculates average rents and decides what constitutes a "rental," vacancy rates, much like inflation numbers, are notoriously low. If a property, or property manager/landlord, doesn't have three "units, " it's not counted. So every new basement suite in GH and Langford isn't counted. And students have a hard time getting rentals because they generally tend to party, move 13 kids into a house for a year (which isn't living, it's partying), move frequently, don't look after stuff, cause problems for landlords with their neighbours, run out of money etc. Their main problem is not that Victoria has low vacancy, it's that they are students with student lifestyles. I feel for people looking for rentals. It is difficult to be picky. I have been lucky in this market because of two things: a really good network, no pets and never putting myself in a position to have to make a rushed decision. My only tip for would be renters in Victoria? Do the same. Establish a network, don't do things/have things that make you an undesirable tenant, and never, ever, ever, put yourself in a position to have to make a quick decision, like say, decide to move in September. What are others seeing in the rental market right now? I'm a political science grad. My interest lied mainly in Canadian politics. No single event did more to shape current politics than Quebec's quiet revolution during the 1960s. From a political economy perspective however, perhaps today's quieter revolution will end up shaping our political and economic landscape to a degree unforeseen by any political or economic scientists. Canadians are more uncomfortable talking about money than religion, says a Bank of Montreal survey out Wednesday showing we are losing sleep over personal finances and our biggest fear is not having enough to retire. "Families are very worried... they may be over-spending and they don't really understand how they can plan for the future," said Sherry Cooper, chief economist at BMO Financial Group. Just under half (46%) of survey respondents said they were least comfortable talking about money, compared with 34% being least comfortable talking about religion. But the survey revealed that six in 10 Canadians will talk openly about their love life and more than three-quarters (78%) would say who they voted for in the last election. (I'm guessing they didn't vote Conservative, just a hunch though). Around 35% of respondents with household incomes greater than $100,000 said they have lost sleep worrying about money matters. "Most people are anxious but they're not taking action... they're being reactive and that's too late." said Cooper. "There is no one-size-fits-all solution . . .You have to plan in advance and financial planning is part of the whole process of lifestyle planning. Can we extrapolate this out into the housing market? Sure. Because the same people have been buying houses, wondering how they can pay for them. When the house doesn't look to be as good a buy as it did in 2006 and 2007, what will these un-financially savvy homeowners do? Probably the same thing as they did when they bought. What's that you ask? The exact same thing as the rest of the herd, er, I mean neighbourhood, does. My guess is sell. And like on the way up, price won't matter, fitting in at the dinner table will. Best graphic on the housing implosion down south I've seen yet. (Funny how people I know keep telling me the Pacific Northwest is immune to the slump, I guess not?) Will we see something like this up here next year? output from real estate agents plunged 16.8% in the month over the year before. Together, activity in the two housing-related sectors fell 4.9% in May from May 2007 -- the biggest slide in a decade of available data. These are interesting financial times we live in. Batton down the hatches, this squall could turn into a long storm. Yours in comments. VREB stats are up: Great news for bears!